Sports Costs > How Much Does Dance Floor Rental Cost? How Much Does Dance Floor Rental Cost? A dance floor will commonly be needed for a large event such as a wedding. While some venues may have a dance floor, some may not. This is where renting a dance floor can come in. When renting, your typical rental companies will be able to install a dance floor within minutes in just about any style and color imaginable. This is a great way to designate a dance floor area and blend in with your party’s theme. How much does it cost to rent a dance floor? For a 12×12 dance floor, which is usually recommended for 40 guests or so, can cost $125 to $350. If more portions are required, each section can cost an additional $5 to $40; this will depend on the dance floor size. This is all going to depend on the rental company, your location and the type of flooring you choose. To budget, plan on spending $1 to $2 per square foot, which would be a one by one-foot tile. For every three square foot of space, plan on accommodating one dancer. For a wood parquet dance floor, the rental fees generally start at $175 to $300, and this type of price range could accommodate about 100 to 150 guests for an indoor event. For an oak plank floor, the price ranges will be about $225 to $350, and this price range could accommodate about 100-150 guests. Vinyl flooring could cost about $250 to $325 for 100 to 150 guests. A LED dance floor, which tends to be more complex, can rent for about $35 to $45 per square foot. Tentrentalscapecod.com, a rental company located in Cape Cod, Massachusetts, charges $32 per four by four New England plank and $30 per four by four oak parquet. Dance floors for a special event are generally rented by the section, and each section can come in the following sizes: 12×12, 12×16, 16×16, 12×18, 15×15, 16×18, 18×18 and 21×21. For indoor weddings, oak plank, vinyl or a wood parquet is a common choice. However, other floor choices are available such as vinyl. 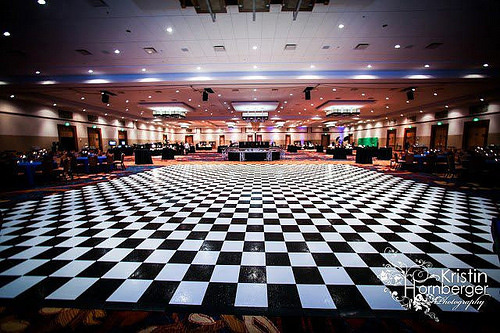 Vinyl dance floors usually come in either an all white, all black or a checkerboard pattern. Most dance flooring material should be designed for indoor or outdoor use. For the prices mentioned above, a company will deliver, setup and pick up the floor when the event is complete. However, there may be additional setup charges. Liability insurance is recommended for those who have a dance floor at a public event. Depending on the size of the party, it can cost about $200 to insure a few hundred people. Most companies will ask for a damage waiver up front. This waiver is often 10 to 15 percent of the rental fee and will be applied to your total bill when the flooring is returned. If the floor will be located near the corner of a tent, you may need pole sections to prevent injury. Just because you have 500 guests, it doesn’t mean you need a floor to accommodate all of these people. As a general rule of thumb, about 40 percent of your guests may dance at a given time. Some dance floor rental companies may only set up dance floors under tents they setup themselves. Talk with at least three to five rental companies in the area to see what they charge. As long as you have the dimensions, you should be able to get a quote over the phone. If you’re handy, consider building your own dance floor. Yourhomebasedmom.com shows you how it can be done for less than $300. Typically, weekdays will be much cheaper than the weekends.